Renee Schroeder currently focuses her practice in the areas of municipal law, bond financing, workers’ compensation defense, mergers and acquisitions, commercial litigation and general corporate law. She represents public entities such as the Winnebago County Housing Authority, Chicago Executive Airport and the Greater Rockford Airport Authority. 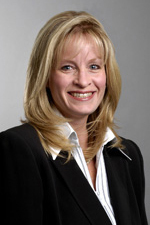 She has acted as bond counsel for tax exempt bonds issued by Winnebago County, the Winnebago County Forest Preserve, and for industrial revenue bonds issued by the Illinois Development Finance Authority and various municipalities. Before joining Hinshaw & Culbertson LLP in 1997, Ms. Schroeder served as counsel for Pioneer Financial Services, Inc., a publicly held insurance, marketing and managed care holding company, for five years. She also served as corporate secretary and general counsel for several of the company’s wholly owned subsidiaries. While affiliated with Pioneer Financial, Ms. Schroeder was involved in its merger into Conseco, Inc., and personally managed or represented the Pioneer companies in all non-claims litigations. She had seven years of litigation experience prior to joining Pioneer Financial Services. "How to Manage Workers' Compensation Litigation in Your Shop," co-presenter, OSF Occupational Health Annual Employer Breakfast, Bloomington, Illinois, May 2013. "Workers’ Compensation Developments," Hinshaw’s Annual Labor & Employment Seminar, Hoffman Estates, October 2011. "Fraud in the Context of Workers' Compensation Claims," Woodward, Inc., Rockford, Illinois, August 2011. "Public Act 097-0018, Including the Newly Amended Illinois Workers' Compensation Act," OSF St. Francis and OSF St Joseph Medical Centers, Peoria, Illinois, July 2011. "Practical Applications of the Illinois Workers' Compensation Act to Nurse Case Managers and the Use of Utilization Review," Triune Health Group, Oak Brook, Illinois and Rockford, Illinois, June 2011.